Despite the fact that there are a lot of punctuation and grammatical mistakes (I’m not a native English speaker), the book is among TOP 10 bestsellers for over a year in 3 marketing related categories on Amazon. This is a 2nd book from the series. You’ll find here new best 101 growth hacks. These are exactly the same growth hacks I shared previously with my invitation-only community of growth hackers. People from companies like Uber, Microsoft, Adobe, Disney, Coca-Cola, LinkedIn, Amazon, eBay, SalesForce, Sony/PlayStation, Indiegogo, TechStars, Samsung read my daily growth hacks. One needs focus and a model to penetrate. Focus taken, what about model? Knocking doors is no more advised - simple reason, might disturb a lot many. Use this as a referral material. 5,0 van 5 sterrenGreat actionable tips for growth hackers! Aladdin always offers actionable tips on growth hacking your products. If you have a product, service or a Web site you are trying to promote on a limited budget or looking for shortcuts for your marketing campaigns, this is a must-get. Also, make sure to subscribe to his email list to get these tips daily. 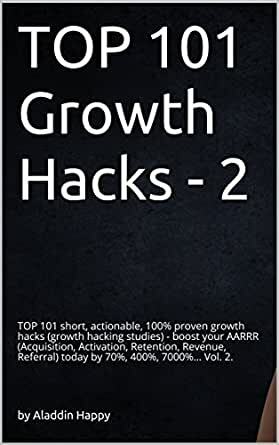 This is collection of simple and ready-to-use proven growth hacks you can immediately implement in your business. Aladdin made a great work find these secret effective hacks from a thousands of articles. Test one hack per day and see where you business would be in next 4 months. I will use at least half ot these hacks immediatley to improve my online shop. Great source of useful ideas!